The Dead Sea is located in a deep valley at the transform boundary between the African and Arabia Plates (shown as a black line on the map above). At over 400 meters below sea level, it is the land area with the lowest elevation. The motions of the African and Arabian Plates, combined with the motion of shear-zone faulting has resulted in the formation of the deep Dead Sea Depression. Image by the United States Geological Survey. Dozens of land areas of the Earth sit below current sea level. The lowest land area is the shoreline of the Dead Sea Depression in Israel, Jordan and Syria. It is approximately 413 meters or 1355 feet below sea level. The largest below-sea-level depression by surface area is the Caspian Depression of Kazakhstan and Russia. It has an area of approximately 200,000 square kilometers or 77,000 square miles of land below sea level. 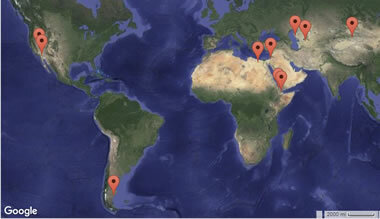 The ten lowest areas on Earth are listed below. We also have a list of 33 countries where land below sea level occurs. Lowest Land Below Sea Level: World map showing the locations of Earth's ten depressions with the lowest dry land. What Causes Most Below-Sea-Level Depressions? Most major depressions are associated with tectonic plate boundaries. They form when converging plates deform or when spreading centers open. A few are volcanic in origin. Most of these depressions are in the northern hemisphere for a good reason: this is where most of the land is and where most of the plate boundaries occur. Many are found in the vicinity of where the African, Arabian and Eurasian plates meet. Most are found in hot desert regions of the planet where high evaporation rates prevent them from filling with water. A few are found in temperature climes. Many well-populated places in the world are below sea level. About a third of the Netherlands including Schiphol Airport is below sea level. So too are the Jordan River and parts of many coastal cities including New Orleans and Bangkok. Other regions below sea level are the Enriquillo-Cul de Sac Depression (Hispaniola), Chott Melrhir Depression (Algeria), Sebkhet Shunayn and Sabkhat Ghuzayyil (Libya), Shatt al Gharsah (Tunisia), Lammefjord (Denmark), Sebkha Tah (Morocco), Hachiro-gata (Japan), Sariqarnish Kuli (Uzbekistan), The Fens (UK) and Lake Eyre, Australia. Of the two hundred and fifty five recognized countries or protectorates in the world, 33 have land below sea level. Most of these are only a few meters down. Most land that is below sea level is located in an area with a very dry climate. The dry climate offers very little rain and very high evaporation. This excess of evaporation over precipitation prevents the depression from filling with water. The photo above shows salt deposits of the Dead Sea - a product of high evaporation rate. Image copyright iStockphoto / Steven Allan. Some below-sea-level depressions are dry, most others have salt lakes. The lakes are undrained, which means water flows in but does not flow out. Since water cannot flow up hill, the lakes cannot empty into the sea like most do and so they accumulate salt as their waters evaporate. Where does the salt originate? Some of it comes from ancient sea floor salt deposits that have been uplifted then weather and release the salt which reaches the depressions via rivers. Many other rocks weather to yield sodium and chlorine ions that are carried to the lake by rivers. The Sea of Galilee is below sea Level but is a freshwater lake because it drains into the Dead Sea through the Jordan River. Owing to variations in rainfall, evaporation rates, and human water use, most of the lake levels fluctuate from year to year. Some have come and gone in historic times. The present Salton Sea was produced by a canal construction accident in 1905, though the lake has come and gone naturally many times in the last thousand years. New Orleans is a city below sea level. It is protected from flooding by seawalls and an extensive groundwater pumping system. 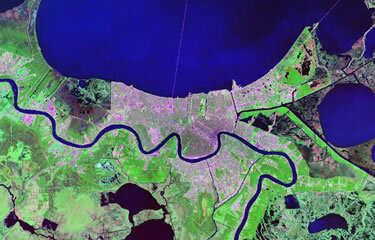 NASA Landsat image composed by Angela King. The lowest exposed land on Earth is at the Dead Sea shore, at -413 meters. The deepest lake bottom in a below-sea-level depression also belongs to the Dead Sea at -750 meters. Lake Baikal in Russia is at an elevation of 447 meters, but with a maximum depth of 1637 meters, its bottom lies at -1190 meters. The Bentley Subglacial Trench in Antarctica reaches 2555 meters below sea level. It is the lowest point on Earth that is not covered by ocean, although it is covered by ice. The trench is huge, roughly the size of Mexico. The deepest point on the ocean floors is -10,916 meters in the Mariana Trench. Trenches are the upper most parts of subduction zones and there are dozens of trench locations that are more than 5000 meters below sea level. Strictly speaking, most of the surface of the Earth is below sea level because oceans cover 71% of the planet. But sea level varies and during the Great Ice Age 18,000 years ago, sea level was 130 meters lower. Today, large areas are under water that during the Great Ice Age were well above sea level. It is also likely that long ago and far into the future, plate tectonics will produce higher mountains and deeper trenches and depressions than we have today. 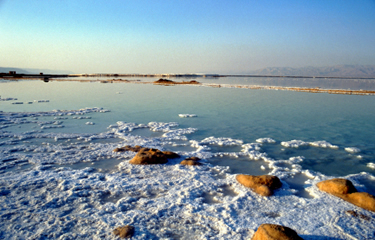 The Dead Sea Depression is an extensive area of land that is below sea level. It contains the Dead Sea, the Sea of Galilee, a portion of the Jordan River, large areas of cultivated land and many communities. The shoreline of the Dead Sea is the lowest dry land on Earth. It is approximately 413 meters below sea level. However, this elevation is constantly changing. The surface of the Dead Sea rises and falls as precipitation, evaporation, irrigation, salt production and other natural and human activities consume the water of the Jordan River, the Dead Sea and its tributaries. The shoreline of Lake Assal is the lowest point in Africa and the second lowest location on Earth. Lake Assal is located in the Afar Depression which is formed at a triple junction of tectonic plates (Indian, African and Arabian). The relative motion of these plates produces a divergence that results in a lowering of Earth's surface. Lake Assal's water emerges from springs which are believed to be fed by groundwater flow from the Gulf of Tadjoura. This water evaporates rapidly because the climate there is one of the hottest and driest on Earth. This high evaporation rate makes Lake Assal the saltiest body of water on Earth. The Qattara Depression is located in the Libyan Desert of northwestern Egypt. At 133 meters below sea level it is the second lowest point in Africa. The depression has no settlements and other than nomadic herders it supports no commercial activity. The Karagiye Depression is located in southwestern Kazakhstan. It has an elevation of approximately 132 meters below sea level. The Denakil Depression is a low area within the Afar Depression of Ethiopia. The Afar Depression is formed at a triple junction of tectonic plates (Indian, African and Arabian). The relative motions of the plates produce a divergence that results in the Denakil Depression. San Julian's Great Depression is located in southeastern Argentina. It is the lowest land location in both the Western and Southern Hemispheres. The deepest part is Laguna del Carbón, at approximately 105 meters below sea level. The area has abundant salt marshes. Death Valley is the location of the lowest land elevation in the United States. It is a north-south trending valley between the Amargosa Range on the east and the Panamint Range on the west. Death Valley is part of the Basin and Range Physiographic Province where north-south trending valleys are bounded on both sides by normal faults. The north and south ends of the valley are formed by the Sylvania Mountains and the Owlshead Mountains. The valley is one of the hottest locations in the United States. The record high temperature for the United States was measured there in 1913 at 134 °F (56.7 °C). Death Valley gets very little rain and the deepest part of the valley is generally dry. However, heavy rains can cause flash floods that produce a large lake in the bottom of the valley. The Akdzhakaya Depression is located in north central Turkmenistan. It is a very arid area located in the Karakum Desert. The Salton Trough is the second lowest depression in the United States. The lowest land in the Salton Trough is along the shoreline of the Salton Sea. The lake level is approximately 69 meters below sea level; however, the lake rises and falls in response to runoff from the New, Whitewater and Alamo Rivers plus some agricultural runoff. The bottom of the Salton Sea is about two meters higher than the bottom of Death Valley. * The elevations listed are approximate. For many of these depressions the lowest point is the shoreline of a lake where water levels rise and fall in elevation in response to rainfall, evaporation, use of water by humans and many other factors. CIA Factbook.